When you are given the chance to be the first you only have one shot, so you better make it count. With the launch of the all new Royal Enfield twin, the builders chosen to produce a custom for the company had a chance to produce the bike in their chosen style for the very first time. 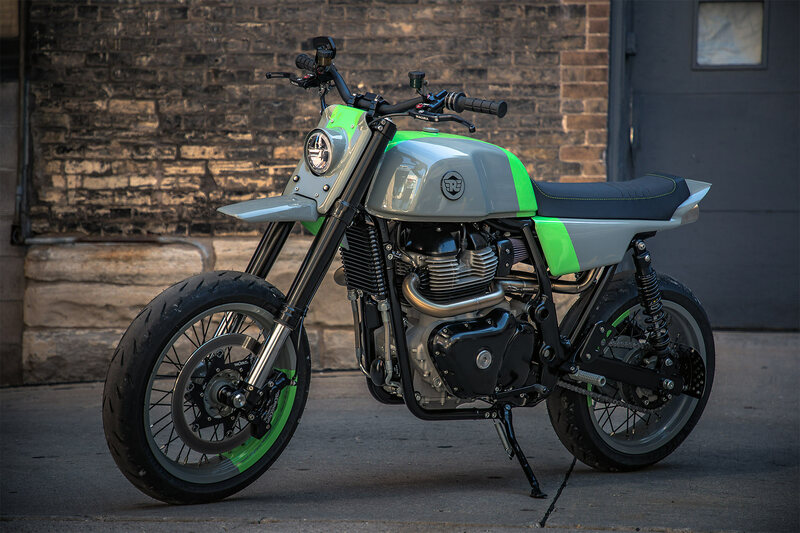 Keen to avoid the well-worn path and not follow trends, Tony Prust of Chicago’s Analog Motorcycles had an idea he knew would be different in the best possible way. 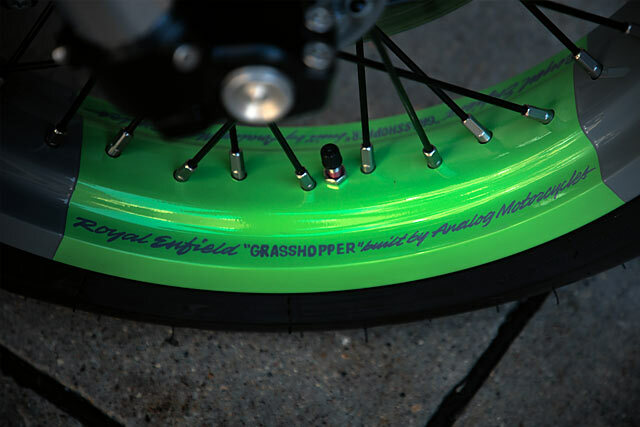 Nicknamed ‘Grasshopper’, it’s a Supermoto with the precision agility to destroy the streets and look damn fly doing it. 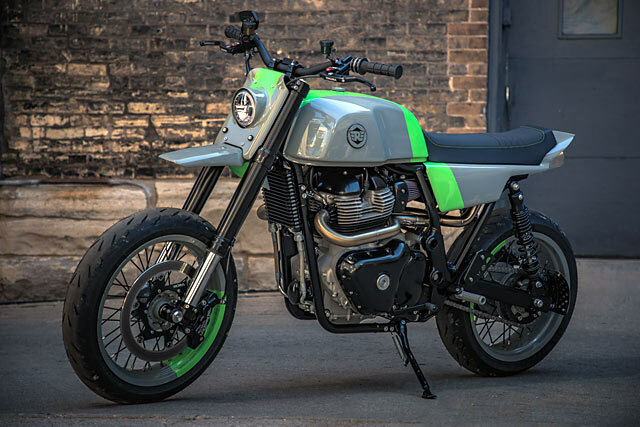 Having received the invite to build a stand out custom for Royal Enfield, Tony had to come up with a plan of attack. “In the initial conversation we discussed current and future trends. 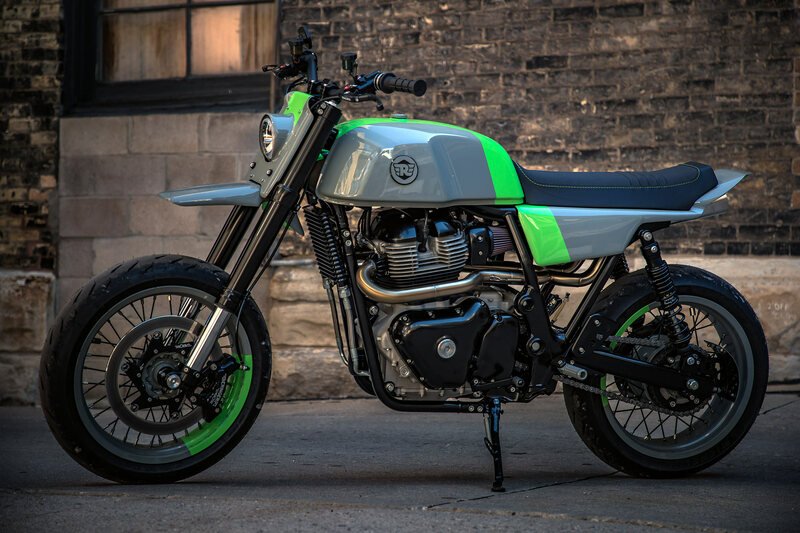 The scramblers have been the hot custom variant the last few years. But putting off-road tyres on street bikes does not make them scramblers really. 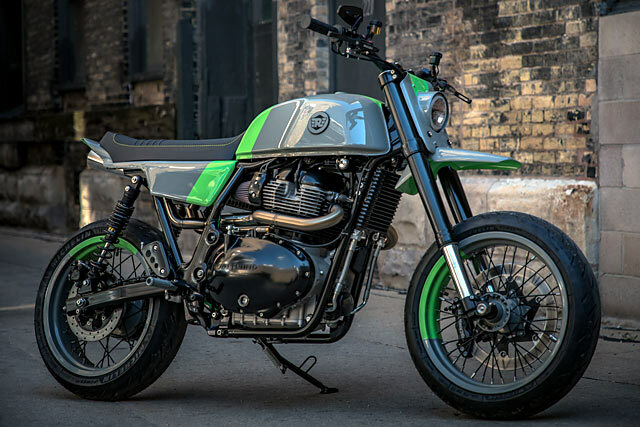 The reality of dual sport or off-road tyres on these ‘scramblers’ is aesthetically kind of cool looking but performance wise not that functional.” explains the Chicago outfits head honcho. 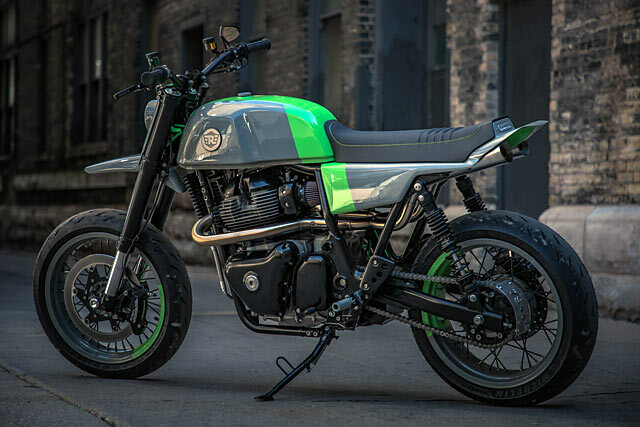 It’s not that Tony doesn’t still love a scrambler, it’s just that with an all new bike to play with and a historic development in Enfield’s engine lineup, he wanted to be able to ring the bike’s neck at every possible chance. 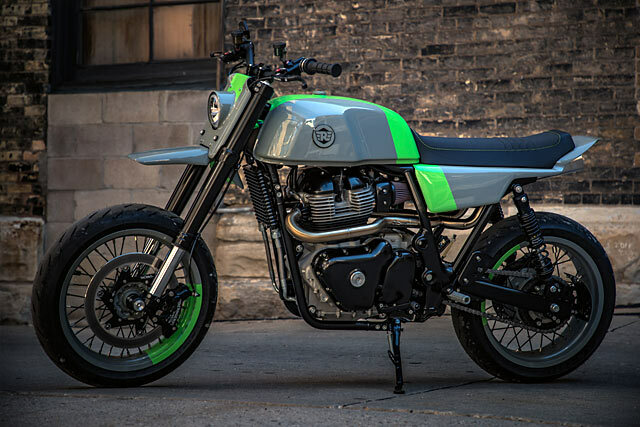 “So why not take an unassuming cafe racer style OEM bike and turn it into a city shredding Supermoto. The Grasshopper was born from that idea,” he smiles. Tearing into the build Analog quickly had the R.E. down to a bare chassis with the rear of the frame modified and the whole thing de-tabbed. Then it was all smoothed out to a flawless finish before being sent out for powder coating. 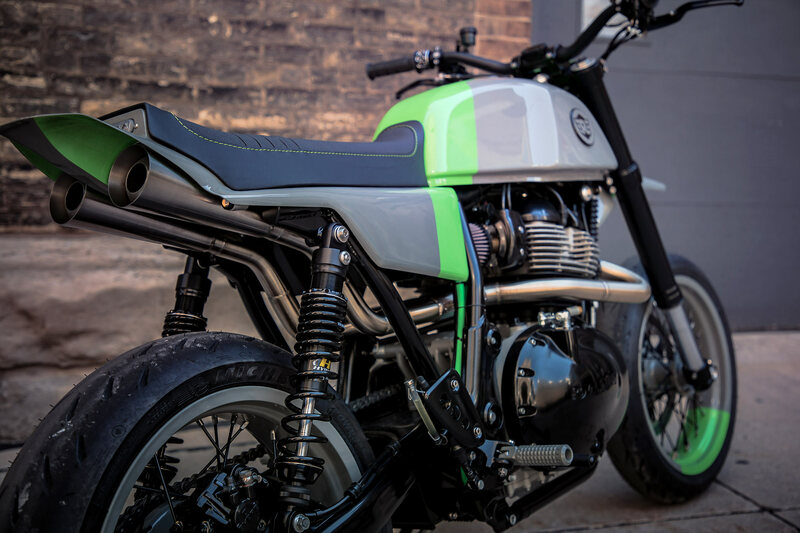 The bodywork completely transforms the look of the classic styling into something far more modern and aggressive. 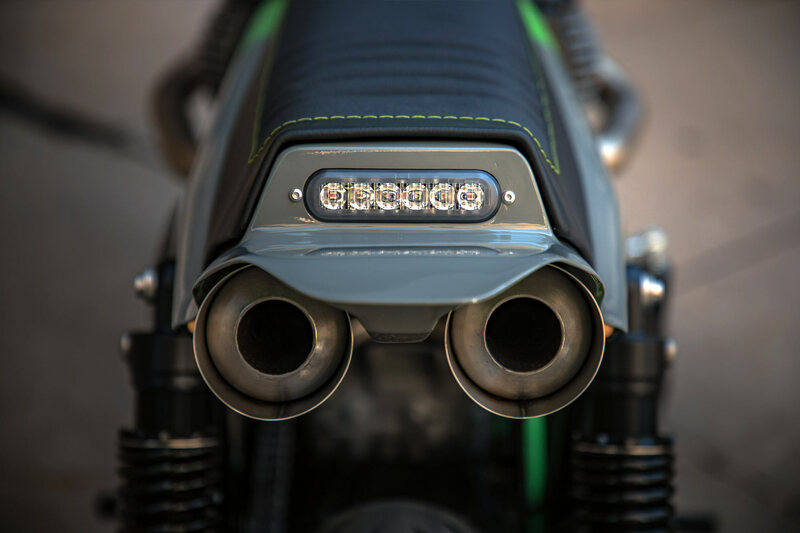 The all alloy tail section is a work of art, incorporating frame fitting side covers, an aggressive rear up kick with room for the pipes and still manages to pick up the lines of the factory tank. Frenched in at the rear is a clear LED DENALI Electronics B6 tail light for an ultra clean finish. While the seat base to match the tail was sent out to Dane Utech who did a brilliant job on the upholstery. Up front the Supermoto look goes into overdrive with a hand-made alloy number plate featuring a DENALI Electronics M4 headlight with custom mounts. The front fender is more brilliantly crafted aluminium, while the tank gets a new welded in filler cap. It also sports a pair of CNC machined badges with the same process used to turn out the pegs. But you couldn’t call a bike ‘Grasshopper’ without the right kind of paint and Artistiomo hit it out of the park with the grey and green combination. All of which is set off by Pinstriping by BrandoMisc that follows the paint even down onto the wheels! Tony’s a big fan of the new engine, “The Royal Enfield 650cc twin power plant makes for plenty of grunt down low and enough power to sit at highway speeds to get you to the next adventure.” But you can always have more of a good thing and a custom-made 2 into 2 exhaust with x-pipe makes sure of that. Form joins function in a spectacular way with the system exiting under the seat thanks to a pair of Cone Engineering mufflers. While the removal of the airbox and K&N Air Filters on a Motion Pro throttle body give even more pep. There’s no point having the Supermoto look if you can’t have the fun to match and that means a serious suspension setup. 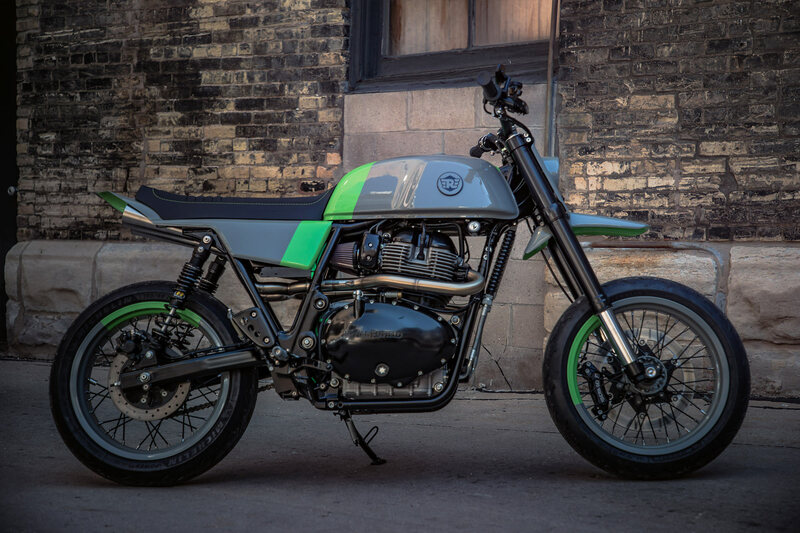 Replacing the Enfield equipment is a far more appropriate inverted fork conversion with parts sourced from a KTM. The front end is held together by a Fly Racing top triple clamp with custom springs and valving by RaceTech. The rear shocks are a work of art having been built just for the job by Hyper Pro. Wheels are a 17″ front rim laced to a KTM hub and 17″ rear laced to stock rear hub with custom-made spokes at both ends. Yes, but can it stridulate? The all important rubber is taken from the Michelin catalogue with a set of Pilot Power RS tyres assigned the task of gripping the road. Calling a halt to the action is made easy with a big dollar Beringer 6 piston front caliper clamping a Beringer single rotor. 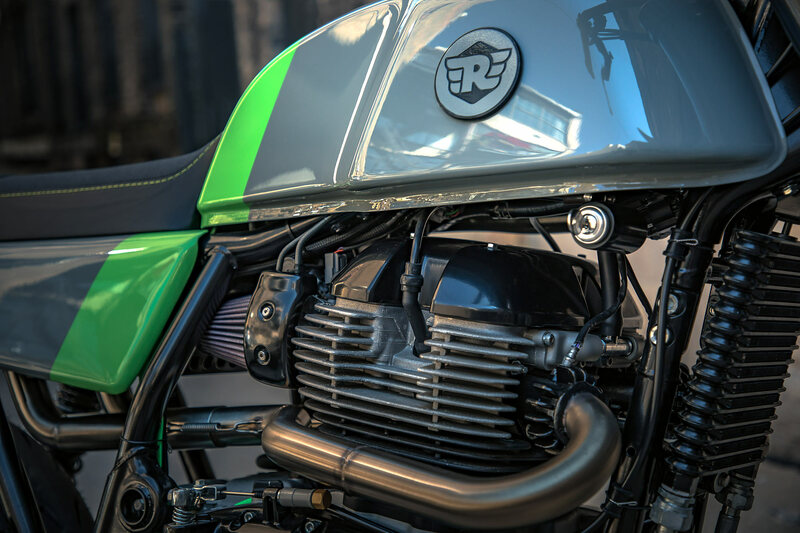 Power is provided by a Magura HC3 Radial master cylinder with the same also controlling the Magura Hymec hydraulic clutch conversion. Both of which are mounted on the same companies X-line SX handlebars with Oury Grips and a CRG Arrow Mirror. Like every Analog build the electronics package is high-end, the wiring ultra neat and it all starts with a Motogadget m-unit. 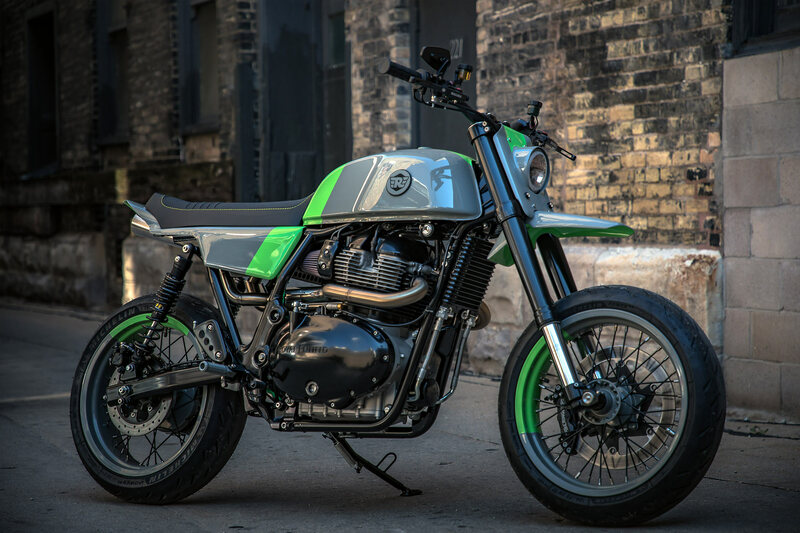 The turn signals are Analog Motor Goods Mini Bolt items with their control handled by Motogadget m-switch minis. 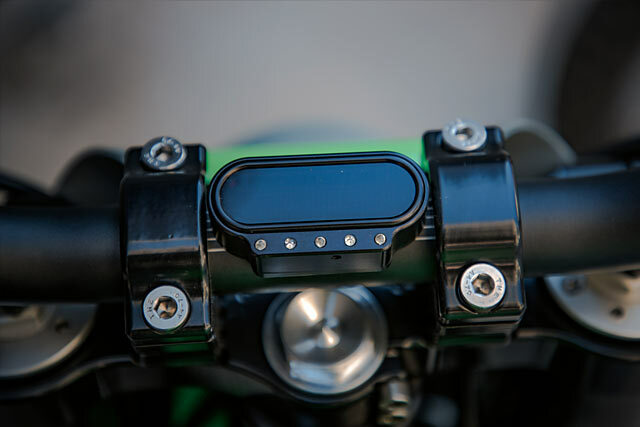 A Motoscope mini Speedo provides only the vital signs and the wiring is completed with WireCare sleeving and shrink tubing for a factory like finish. With that another Analog masterpiece is complete, “The perfect custom to go and have hours of fun in the city or twisty mountain roads,” as Tony sees it. And with the front wheel hoisted into the air and that new R.E. twin screaming who can argue that this little insect delivers a hell of a bite!